You know that for a fact? What is your source? It sounds implausible to me — why would PERS count the bonus money as income but not assess the usual PERS charges on it? There is nothing in that old O story you cite to back up your claim, as far as I can tell. While PERS was fully funded in the early 2000’s, having 100% of the reserves needed to fund its obligations, deals like this blew the bank, and it’s now at 71%. Therefore, as the official PERS report that I linked to explains, 40% of current payments to PERS are now being used to fund payments for past retirees such as Mike Bellotti. Sorry, the story simply doesn’t support what you wrote. And, it’s ridiculous to claim that deals like Belotti’s, however ill-conceived, are responsible for the PERS unfunded liability. Some of those costs are a benefit to current workers. If you’re Tier 1 PERS, you are benefiting. If you are Tier 1 ORP, you are benefiting. If Tier 3, you are getting little or no benefit. It should be possible to come up with a reasonable (but by no means exact) estimate of the value of the retirement benefit to each of the classes of employees. It is my understanding — perhaps someone out of date by now, I haven’t kept up — that the Tier 3 benefit is worth about 12% of salary. On the other hand, Tier 1 ORP persons are getting about 21-22% direct contribution, and also the added benefit of of having the return on their old PERS accounts guaranteed at 7.5%. (The size of that benefit varies widely depending on how bit the account is. It also turns into.) Ditto the Tier 1 PERS person on their PERS account prior to the time when the rules were changed. This all gets pretty complicated, but it is not beyond the capability of our VPFA to figure this out. They probably have it all figured out, I would think, but maybe I overestimate them. Or perhaps they just don’t want to publicize the data. The striking thing about the Delashaw pension is that it’s _not_ a money match. It’s full formula and replaces only 37% of his final salary, but it’s based on an obscenely high final salary of $1.8 million (= 1.92 Gottfredsons) from OHSU. That’s where the problem lies in this case. 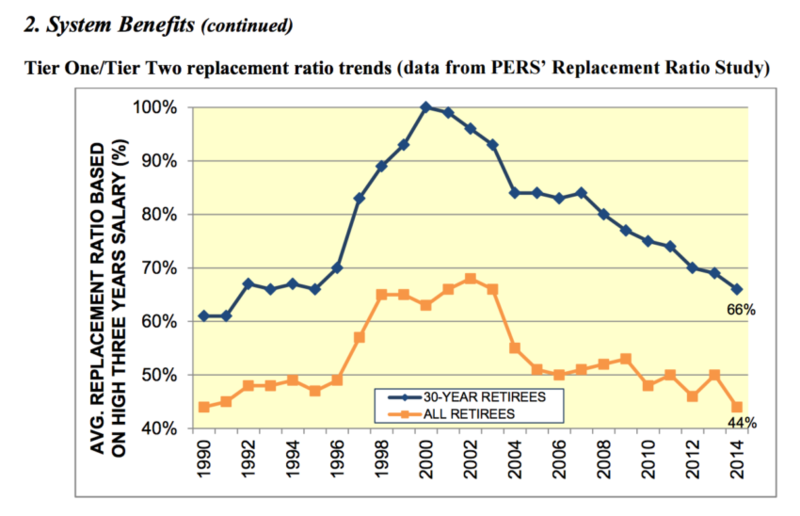 Meanwhile, the Tier One replacement ratio for new retirees continues to fall from its high of 100% in 2000 to 66% in 2014 for those with 30 years of service, no higher than it was back in 1992. In a just world, of all the people who should earn $1.8M a year, a decent neurosurgeon would be pretty high on my list. But you’re right about the pension, and in fact the IRS now limits the amount of salary that can be covered by tax-advantaged pensions to $350K or so. Delashaw and Bellotti were grandfathered in. The thought that anyone working in athletics is deemed a public employee is insulting. Too bad nobody in politics will take this issue up and make them exempt from stealing from the taxpayers and actual public servants.